The History of the French and Indian Wars (1688-1763) including details of the cause, reason, and summaries. The dates and years of the series of intermittent conflicts called the King William's War, Queen Anne's War, King George's War and the French Indian War (1754-1763). The causes of the French and Indian Wars which were the North American counterparts to the wars that raged in Europe. Interesting facts and information about the significance, specific events and famous leaders of the French and Indian Wars. 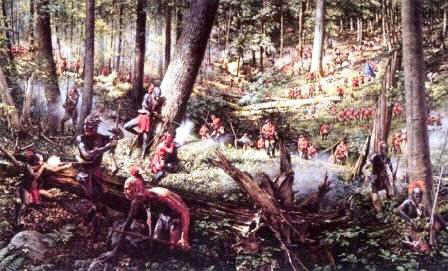 The main combatants of the wars were the British and the French both supported by their allies from the Woodland tribes. Discover the history and who won the French and Indian war. The final British victory at the Battle of Quebec in 1759 led to the fall of New France in 1760 and the end of the series of wars. 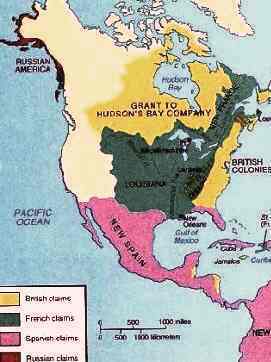 The French and Indian War ended with the Treaty of Paris in 1763 when France ceded its North American territory to Great Britain. So ended the French and Indian Wars. The British were the victors. Because of the confusion over the same names attributed to the Seven Years War in both North America and Europe this conflict is referred to as the French Indian War in America. To clarify further, the French and Indian Wars (plural) was the generic name given to the individual King William's War, Queen Anne's War, King George's War and the French Indian War (singular). For additional Facts and info refer to the French in America. The following map shows the land claims made by the French, British and Spanish, the boundary line of the lands of the Iroquois confederacy and the disputed areas of the New World during the French and Indian Wars. King William's War (1688-1699) is the name given to the first conflicts in the French and Indian Wars. It was named after the King William III who was the English monarch at the time of the conflict. King William's War was the North American extension of the War of the Grand Alliance in Europe. King William's War involved French Canadians and New England colonists and their Indian allies. The English captured Port Royal, Acadia (which later became Nova Scotia), but failed to take Quebec. The French won conflicts at Schenectady, New York, and in New England but failed to take Boston. The war ended with the Treaty of Rijswijk which was ratified on January 7, 1699. The peace did not last long, and within five years, the colonies were embroiled in the next of the French and Indian Wars which was named Queen Anne's War. Queen Anne's War (1702-1713) is the name given to the second of the conflicts in the French and Indian Wars. It was named after the Queen Anne who was the English monarch at the time of the conflict. Queen Anne's War was the counterpart of the War of the Spanish Succession in Europe. In addition to the two main combatants England and France, the war also involved a number of American Indian tribes and Spain, which was allied with France. During Queen Anne's War American colonial settlements along the New York and New England borders with Canada were raided by French forces and their Indian allies during this period of the French and Indian Wars. The British captured of Port Royal in 1710 that resulted in the French lands called Acadia becoming the British province of Nova Scotia. Under the Treaty of Utrecht (1713), Great Britain also acquired Newfoundland and the Hudson Bay region from France during this important conflict in the French and Indian Wars. King George's War (1744 - 1748) is the name given to the third of the series of conflicts in the French and Indian Wars. It was named after the King George who was the English monarch at the time of the conflict. King George's War was the North American extension of the War of the Austrian Succession in Europe. King George's War involved disputes over the boundaries of Nova Scotia and the borders of northern New England and control of the Ohio Valley. The war ended with the Treaty of Aix-la-Chapelle in 1748 that restored conquered territory but failed to resolve colonial issues that had arisen during the French and Indian Wars. The French Indian War (1754-1763) is the name of the fourth and final series of conflicts in the French and Indian Wars. It was the North American counterpart of the Seven Years War that was fought in Europe against France and Austria. The Seven Years War in Europe had been caused by the commercial and colonial rivalry between Britain and France and the conflict in Germany between Prussia and Austria. The North American dispute was whether the upper Ohio River valley was a part of the British empire or part of the French Empire. The population of the area was predominantly occupied by British settlers but France had made the greatest inroads into the exploration, trade, and Indian alliances in the area. In 1754 the French gained a victory and ousted a British force, including a colonial militia under Colonel George Washington, at Fort Necessity, Pennsylvania. Until 1757 France continued to dominate, but in 1758 Great Britain increased aid to its troops based in North America and won victories at Louisbourg, Fort Frontenac, and Fort Duquesne in Pittsburgh. The final British victory at the Battle of Quebec in 1759 led to the fall of New France in 1760. The conflict known as the French and Indian Wars ended with the Treaty of Paris in 1763 during which France ceded its North American territory to Great Britain. So ended the French and Indian Wars. The number of British troops who fought in the French and Indian Wars started in King William's War (1688-1699) with just under 2,000 men in arms on both sides. The scale of escalation and the severity of each successive conflict in the French and Indian Wars ended with 25,000 British regular soldiers fighting in the Seven Years War. The effect of the wars helped to bring about important changes in the British colonies. The American colonies felt less dependent militarily on the British by the end of the French and Indian Wars. The American Colonists became more concerned with their own problems than that of the 'Mother Country' and put greater value on their own institutions. Following the French and Indian Wars British incurred a massive war debt which led to them reversing their policy of Salutary Neglect that ultimately led to insurrection in the colonies, the Boston Tea Party, the American Revolution and the Declaration of Independence. This short History Timeline of the French and Indian Wars provides fast facts and information about the history, years & dates, key events and famous people who fought in the French and Indian Wars and who won the French and Indian war. 1710 The British captured of Port Royal in 1710 that resulted in the French lands called Acadia becoming the British province of Nova Scotia during the French and Indian Wars. 1713 The Treaty of Utrecht ends Queen Anne's War by which Great Britain acquired Newfoundland and the Hudson Bay region from France during the French and Indian Wars. 1736 The Chickasaw Wars (1736, 1739 and 1752) were fought between the Chickasaw allied with the British against the French and their allies the Choctaws and Illini. 1748 The war ended King George's War with the Treaty of Aix-la-Chapelle that restored conquered territory but failed to resolve colonial issues. 1763 The Treaty of Paris ends the Seven Year War (1754-1763) and the French and Indian Wars. Canada, east of the Mississippi River, was added to the British empire. Discover the key years, famous people and events of the French and Indian Wars together with the causes and effects of the war, conflict and battle. Pictures have been include wherever possible which show the battlefield, clothing and weapons of the Native Indian tribes and their leaders who fought in the series of conflicts. The illustrated text provides a really useful educational resource for kids and children of all ages. We have included pictures and videos to accompany the main topic of this section. The videos enable fast access to the images, paintings and pictures together with the information and the many facts featured on this subject of the French and Indian Wars.